But Ricardo had prepared a nice array of his creations for us... so I tried to power through. Foie gras / tonka bean - creamy as expected, and kinda savory. 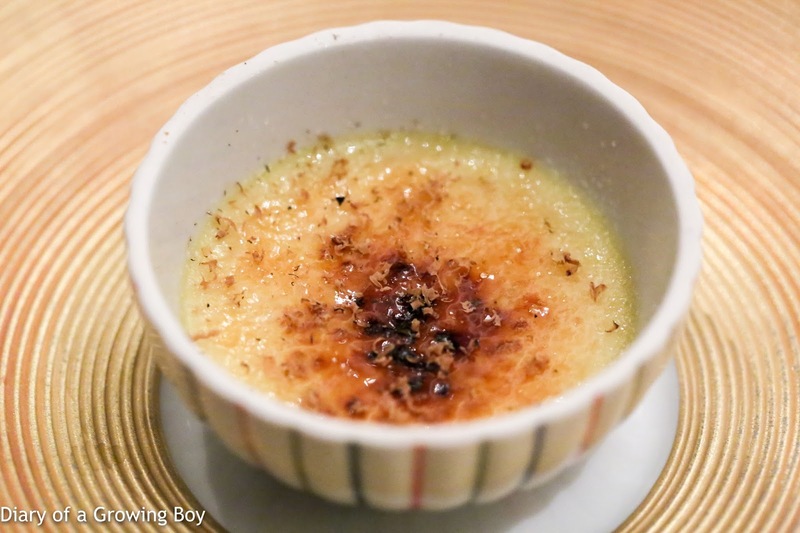 The distinct fragrance of tonka beans was a nice touch. 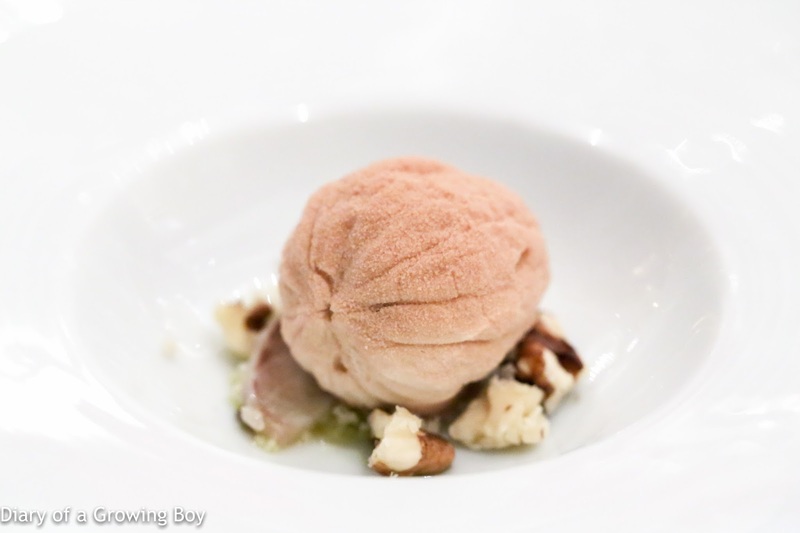 Walnut / smoked eel - the walnut-shaped walnut mousse contained small chunks of smoked eel inside, with slices of eel and chunks of toasty walnuts at the bottom along with some horseradish. This was a nice idea, but I felt the walnuts chunks were a little too bitter and overpowering. Green leaf / cucumber - I've known about Ricardo's hydroponic garden on the rooftop of the building for a while, and this wasn't surprising knowing his time spent at Mirazur. He's put together a collection of 15 ingredients in a bowl, with no seasoning whatsoever other than the pickled baby snake cucumber. Ricardo suggested that we at them "as is" - without adding the Sicilian olive oil he provided on the side - as each of the leaves would provide its own seasoning. I understood what he was trying to do, but still found the result a little bland. 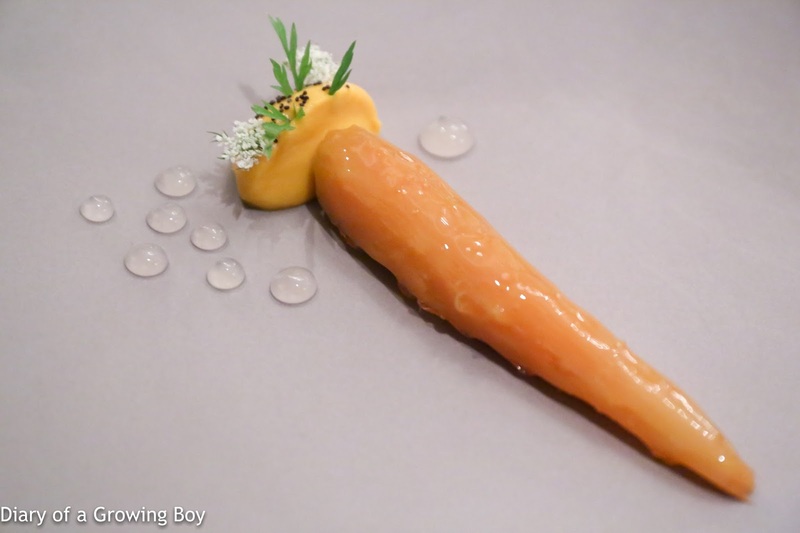 Carrot / uni / ginger - the slender heart of carrot looked beautiful as the ginger gel glistened under the lights. 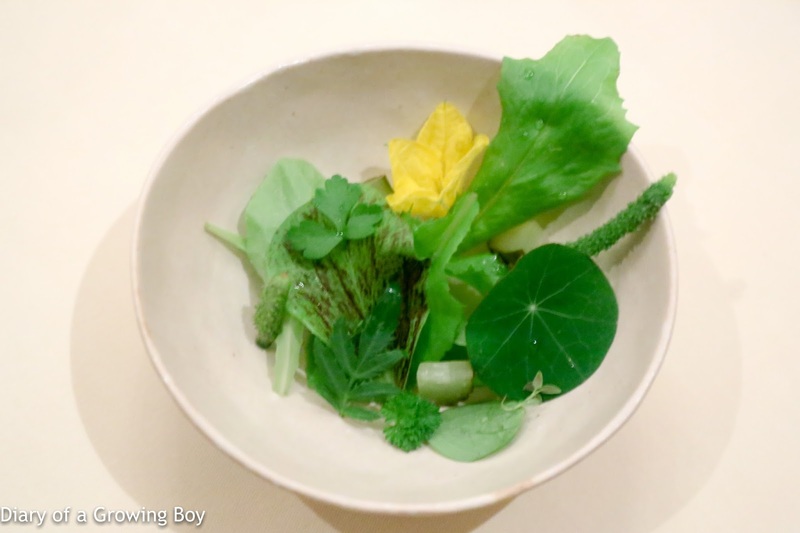 The exterior of the carrot has been made into a purée and garnished with the flowers and baby leaves of the carrot. Lentils / Colonnata / ham - apparently Ricardo calls this a "salad"... even though there is clearly plenty of lardo di Colonnata with the slightly toasty lentil germs, lentil sprouts, and tarragon. 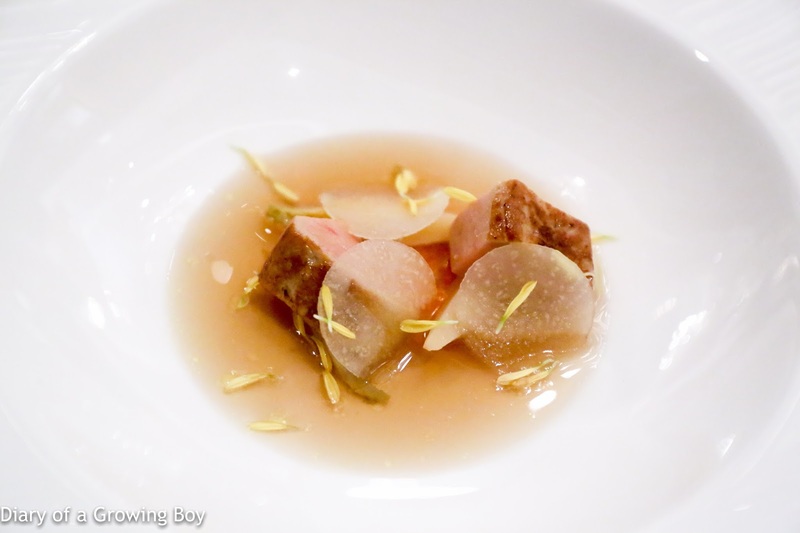 The dish was finished with some broth made with jamón ibérico de bellota. Nice and light, n'est-ce pas? 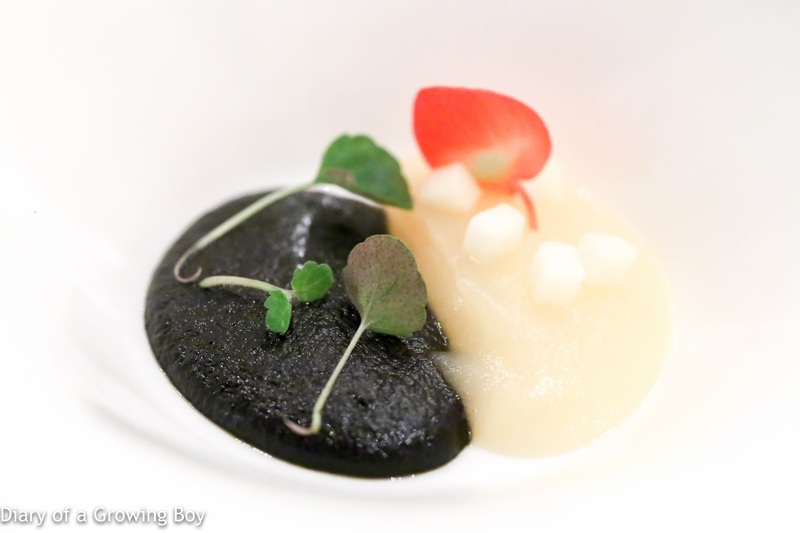 Taleggio / Cevennes / tuber melanosporum - without a doubt my favorite dish of the evening. 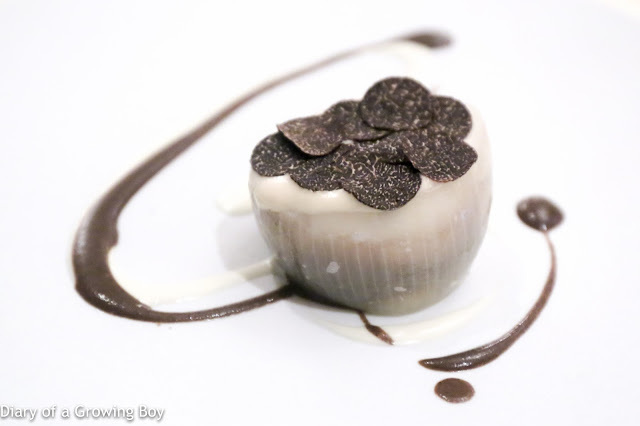 The Cevennes onion was filled with a Taleggio cream with bits of black Périgord truffles, then topped with thin discs of truffles, and finished with truffle coulis and Taleggio coulis. 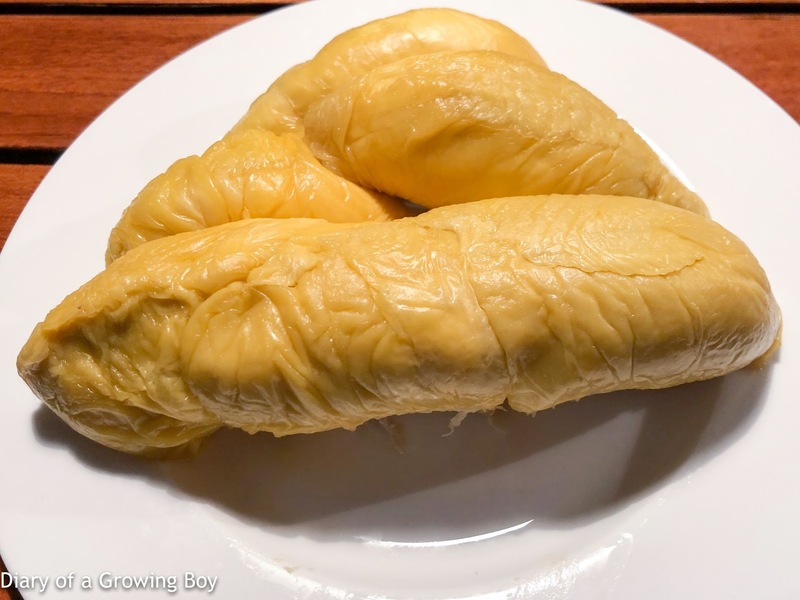 A real warm and comforting dish. Such wintery flavors. The Taleggio cream was soooo satisfying, working well with the sweetness from the onion. I was a real happy camper after this dish. 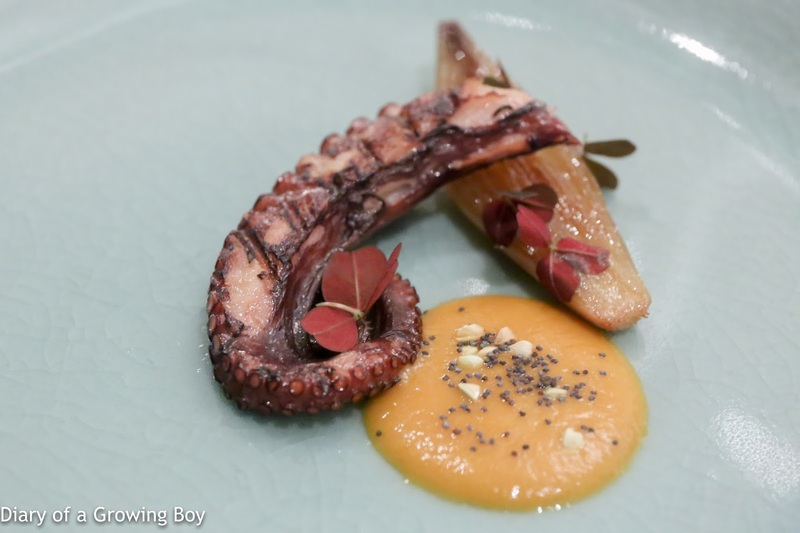 Octopus / romesco / shallot - the grilled octopus was very tender, with nice, smoky flavors. The confit shallot delivered some beautiful sweetness, and romesco made with smoked pimenton de La Vera - with some buckwheat sprinkled on top of the romesco. Blood pudding "mole" / Gala apple - the mole was made with 65 ingredients including black pudding, and I could certainly detect the fragrance of fennel and anise. Very deep and complex flavors here. Nicely paired with the sweetness of Gala apple chunks of purée. Duck foie gras / golden turnip / chrysanthemum - the poached chunks of foie gras were perfectly tender and melted in the mouth. Along with the consommé we've also got thin slices of turnip as well as pickled chunks. 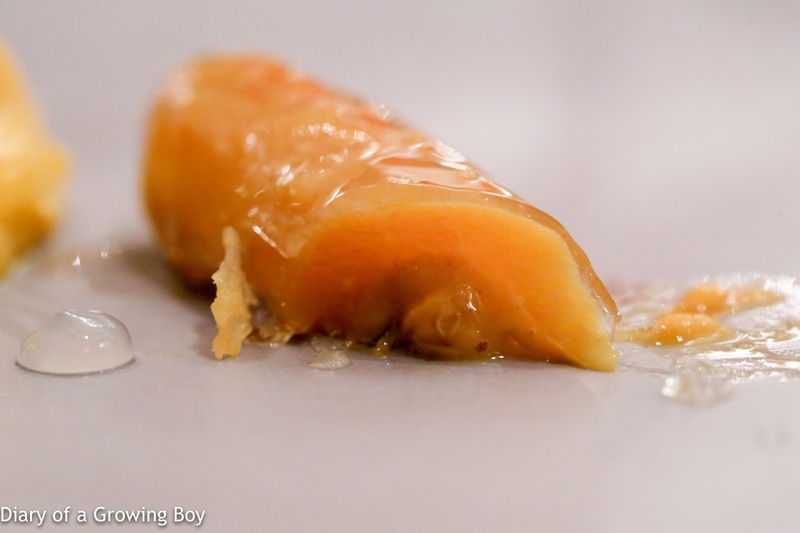 The smoked trout roe complemented the slightly browned exterior of the foie pretty well. Meagre / chickpeas / calamari / chorizo - I find that corvina does have an interesting flaky texture, but sometimes I find it a little bland - as it was tonight. In this case it was helped by an eclectic mix of calamari, fish guts, chorizo, and chick peas. The fish guts gave the mixture a milky texture, with acidity and smokiness coming from the chorizo. I was too full by this point, and did not finish the dish. 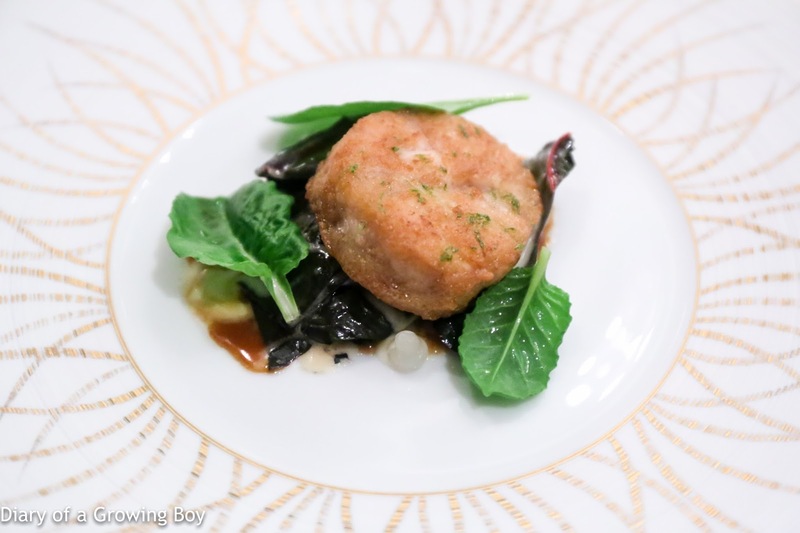 Veal sweetbread / Parmesan / Swiss chard - the breaded sweetbread was pretty nice, but once again I could not it. 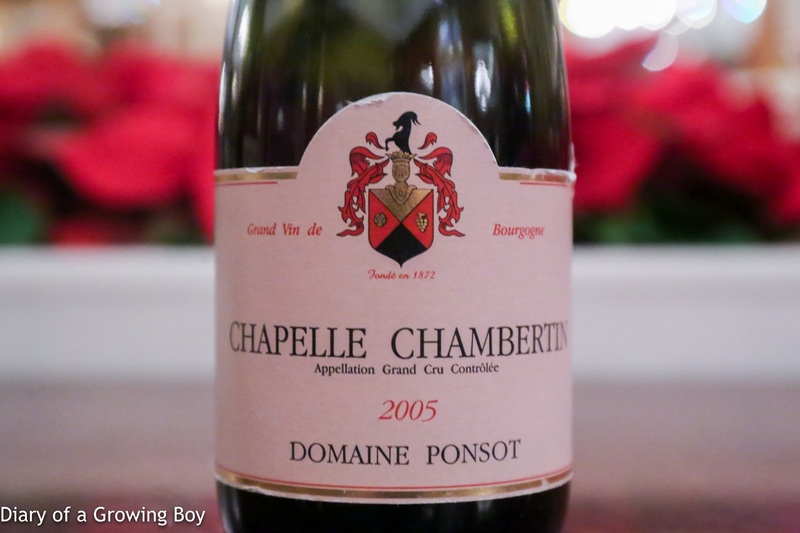 Served on top of a bed of Swiss chard and something with acidity... was it rhubarb, perhaps? Lièvre à la Royale - I knew we would be having this tonight, as Ricardo had already posted pictures of it on Instagram. Ricardo announced that he was serving us "a classic dish, in a classic restaurant, with classic service" as cloches were lifted from the plates. 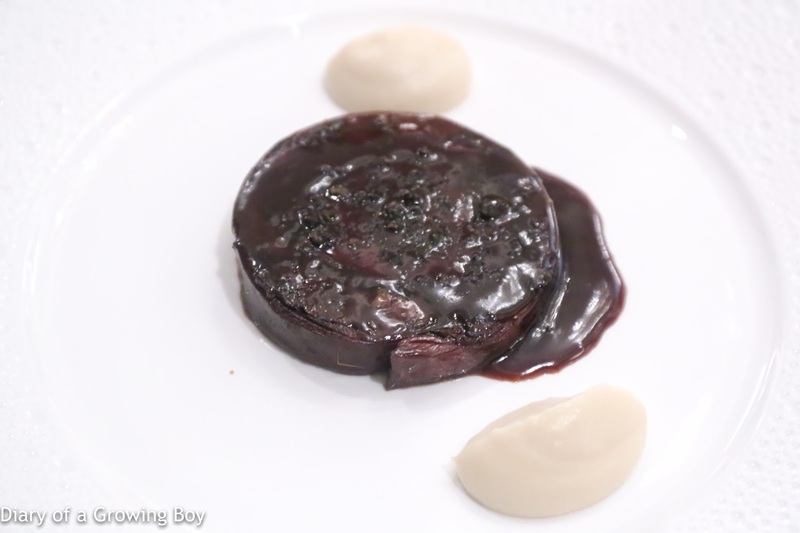 Hare rolled up with foie gras at the center and some black truffle inside, and of course drenched in the blood sauce. Served with celeriac purée on the side. I would have inhaled this dish on any other night, but failed completely tonight. 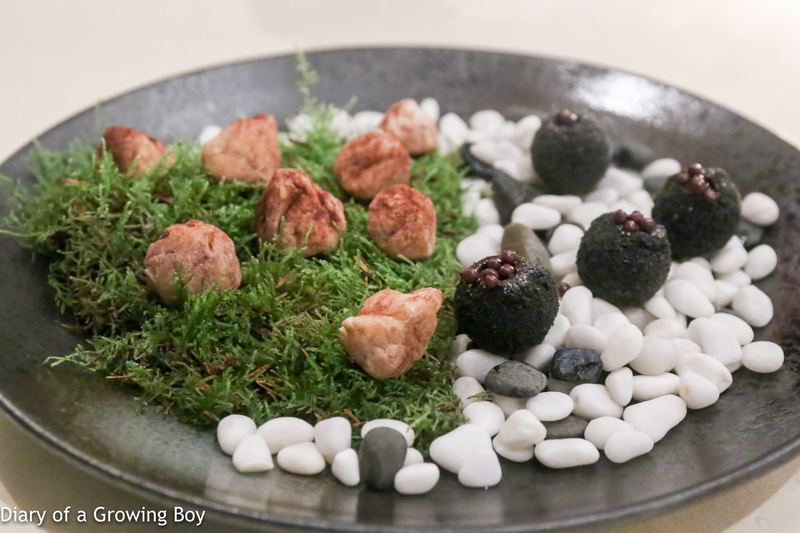 Peanut / sunchoke / magnatum pico - the "peanuts" molded from peanut mousse was OK, but the Jerusalem artichoke ice cream was interesting, especially with the crunchy skin of the root with some toffee. 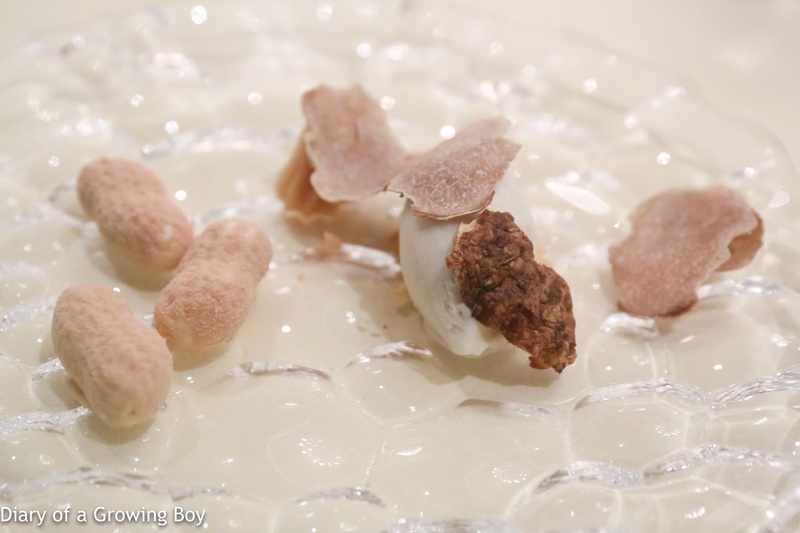 And just to make things a little more luxe, a few shavings of white truffle. 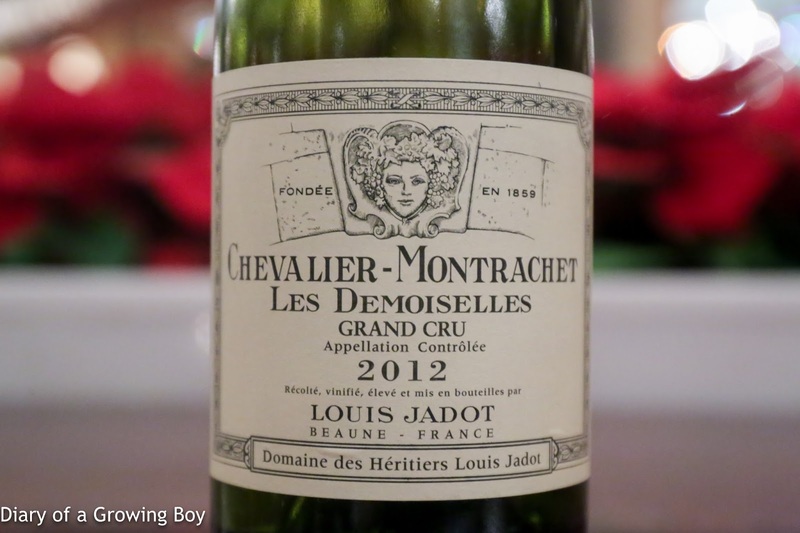 This was a fun dinner. I would have enjoyed it more had I actually been hungry, but I could still appreciate the thought process and worked that Ricardo put into all the dishes. Hopefully he can continue to develop his repertoire, and it would be interesting to watch him come into his own over the next few years.